Organic farm on beautiful West Bay offering vegetables, salad greens, herbs, flowers, preserves, herb vinegars, hand spun hand dyed yarn, knitted hats, felted rugs, pottery, hand turned bowls. 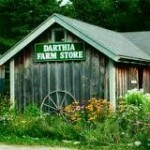 CSA farm shares available. Mail order in the fall. Open Monday-Friday, 8 am-5 pm, Saturday 8 am-noon.